1 First Steps, First Shots In This Chapter Preparing the camera for its first outing Getting acquainted with the touchscreen and other camera features Viewing and adjusting camera settings Setting a few basic preferences Taking a picture in Auto mode Shooting for the first time with a camera as sophisticated as the Nikon D5500 can produce a blend of excitement and anxiety. On one hand, you can't wait to start using your new equipment, but on the other, you're a little intimidated by all its buttons, dials, and menu options. 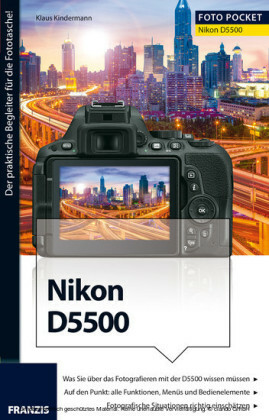 Well, fear not: This chapter provides the information you need to start getting comfortable with your D5500. The first section walks you through initial camera setup; following that, you can discover how to view and adjust picture settings and get my take on some basic setup options. At the end of the chapter, I walk you step-by-step through taking your first pictures using Auto mode, which offers point-and-shoot simplicity until you're ready to step up to more advanced options. Preparing the Camera for Initial Use After unpacking your camera, you have to assemble a few parts. In addition to the camera body and the supplied battery (be sure to charge it before the first use), you need a lens and a memory card. 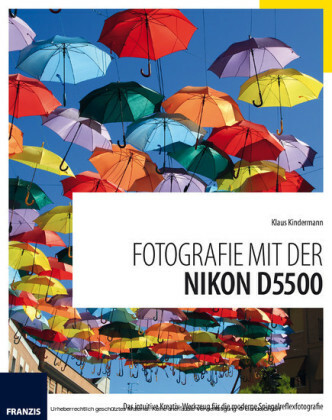 Later sections in this chapter provide details about working with lenses and memory cards, but here's what you need to know up front: Lens: You can mount a wide range of lenses on your D5500, but some aren't compatible with all camera features. For example, to enjoy autofocusing, you need an AF-S or AF-I lens. 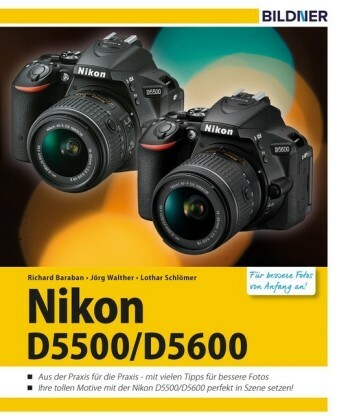 (The 18-55mm and 18-140mm lenses available as a kit with the D5500 body are both AF-S lenses.) Your camera manual offers details about lens compatibility. The AF in AF-S stands for autofocus, and the S stands for silent wave, a Nikon autofocus technology. AF-I lenses are older, professional-grade (expensive) lenses that are no longer made but may be available on the secondhand market. SD (Secure Digital) memory card: Your camera accepts only this type of card. Most SD cards carry the designation SDHC (for High Capacity ) or SDXC (for eXtended Capacity ), depending on how many gigabytes (GB) of data they hold. SDHC cards hold from 4GB to 32GB of data; the SDXC moniker is assigned to cards with capacities greater than 32GB. With camera, lens, battery, and card within reach, take these steps: Turn the camera off. Shooting for the first time with a camera as sophisticated as the Nikon D5500 can produce a blend of excitement and anxiety. On one hand, you can't wait to start using your new equipment, but on the other, you're a little intimidated by all its buttons, dials, and menu options. 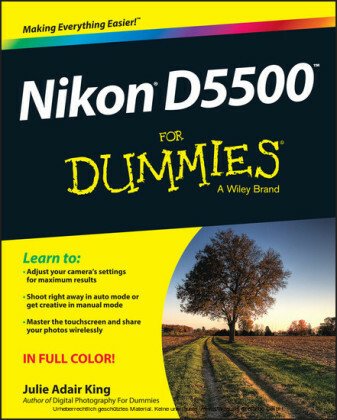 Well, fear not: This chapter provides the information you need to start getting comfortable with your D5500. The first section walks you through initial camera setup; following that, you can discover how to view and adjust picture settings and get my take on some basic setup options. At the end of the chapter, I walk you step-by-step through taking your first pictures using Auto mode, which offers point-and-shoot simplicity until you're ready to step up to more advanced options. Lens: You can mount a wide range of lenses on your D5500, but some aren't compatible with all camera features. For example, to enjoy autofocusing, you need an AF-S or AF-I lens. 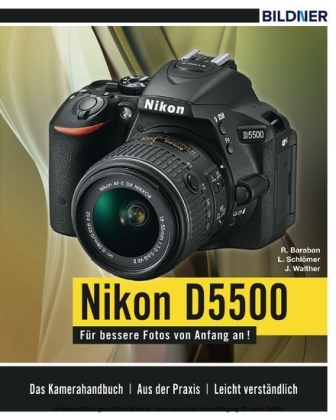 (The 18-55mm and 18-140mm lenses available as a kit with the D5500 body are both AF-S lenses.) Your camera manual offers details about lens compatibility. The AF in AF-S stands for autofocus, and the S stands for silent wave, a Nikon autofocus technology. AF-I lenses are older, professional-grade (expensive) lenses that are no longer made but may be available on the secondhand market. SD (Secure Digital) memory card: Your camera accepts only this type of card. Most SD cards carry the designation SDHC (for High Capacity ) or SDXC (for eXtended Capacity ), depending on how many gigabytes (GB) of data they hold. SDHC cards hold from 4GB to 32GB of data; the SDXC moniker is assigned to cards with capacities greater than 32GB. First, remove the caps that cover the front of the camera and the back of the lens. Then align the mounting index (white dot) on the lens with the one on the camera body, as shown in Figure 1-1 . After placing the lens on the camera mount, rotate the lens toward the shutter-button side of the camera. You should feel a solid click as the lens locks into place. Open the card-slot cover on the right side of the camera and orient the card as shown in Figure 1-2 (the label faces the back of the camera). Push the card gently into the slot and close the cover. The memory-card access light, labeled in the figure, illuminates briefly to let you know that the camera recognizes the card. Rotate the monitor to the desired viewing position.